I made these grown up cupcakes for a friend of mine to celebrate his birthday. My preference is to make mini cupcakes. Perhaps it’s nice to have such fancy treats in small packages. I always think a standard shop sized cupcake is too big, and a little greedy. With this size, you don’t need to feel guilty eating two, and they make for a dainty little package. I think this is a killer flavour combination. I used 12 year old Chivas Regal Scotch Whisky in the frosting, Green and Black’s Fair Trade cocoa powder and fresh walnuts from the farmers market. **Replace with dark brown sugar if you need to. To make the cupcakes, melt the butter and chocolate in a small saucepan with the milk, stirring till smooth and well combined. Preheat the oven to 180oC. Mix in the sugar and allow to cool before whisking in the egg. Sift the flours and cocoa in a mixing bowl, stir in the wet ingredients. Scoop the mixture into the mini cupcake pan, filling each cup to just below the top. Bake for about 10 minutes, or until an inserted skewer comes out clean. Transfer to a wire rack to cool. To make the frosting, in a small bowl or teacup, combine the whisky and muscovado sugar, breaking up any lumps and stirring to dissolve. In a medium sized mixing bowl, beat the butter and gradually add the icing sugar. When you’ve added about half the icing sugar, add the whisky mixture and combine. Gradually beat in the remaining icing sugar. To decorate, transfer the frosting to a piping bag fitted with a round tip. Pipe a spiral of frosting on top of the cupcakes, beginning at the outer edge of the cupcake, working inward. 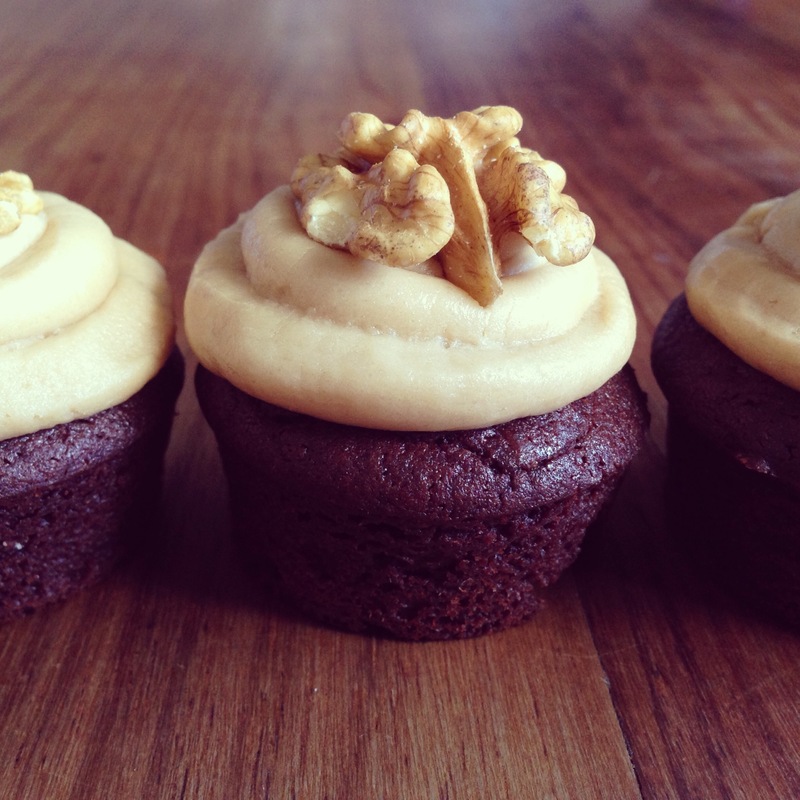 Place a walnut half on top of each cupcake and press down well. This entry was posted in Dessert, In-Betweens, Morning or afternoon tea and tagged cake, chocolate, cupcakes. Bookmark the permalink.